Axed Posh goalkeeping coach Jimmy Walker (right) in his last day at the club at MK Dons. Photo: Joe Dent/theposh.com. Sacked goalkeeping coach Jimmy Walker has called the Peterborough United players ‘pea-hearts’ in a late-night Twitter tirade. Walker, who lost his job along with manager Darren Ferguson and four other members of the coaching team following yesterday’s (February 21) 3-0 League One defeat at MK Dons, claimed the playing squad had no pride. Walker’s tweet read: “Don’t think I’ll be sleeping tonight!! Hazard a guess most of them w*** players with hearts the size of a pea will be soundo.” #nopride. Walker, who joined Posh as goalkeeping coach in March 2013, went on to say, “Let’s get this straight. When things aren’t going well I’m the first to look in the mirror unlike some so of course we (coaches) must shoulder the blame, although our desire has never been in question! I’m disapointed to go, but (I’m) going with head held high. I enjoyed my time at Posh and the club was great to me giving me (my) first chance in coaching which I thoroughly enjoyed and I will strive to be the best I can be in the future! “The chairman has been more than fair and was always honest and demanding which is all you can ask. We had 22 clean sheets last season, won the JPT at Wembley and got to the play-off semis. Bobby (Olejnik) and Joe (Day) both improved and were sold. The wage bill was cut whilst bringin in the best goalkeeper the club has had...and also potentially the best in Dion (Henry). I’ve been buzzing to see him at number two at the age of 17. Ferguson has yet to make a public comment on his departure, but winger Jon Taylor admitted today that the players have let the coaching staff down. On Twitter, Taylor said: “Absolutely embarrassed to tweet after yesterday’s game (as) the first 45 minutes were awful in a massive game for everyone. The fans were amazing throughout and deserved a lot more. The manager deserved 10,000 times more as he did everything for us and players have let him and the coaching staff down which I am ashamed about as he and his staff were all great coaches and great people. 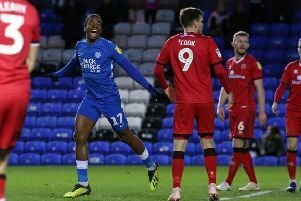 Yesterday’s defeat left Posh 15th in League One, four points off a play-off place and eight points clear of the relegation zone.